Takoyaki is a recent addition to Japanese cuisine that is extremely popular in the Osaka region. The literal translation would be fried octopus, but I prefer to call it octopus balls. 😀 While there is no relation to the testicles of an octopus, it is by far the best way to imagine what takoyaki is. The basic premise of takoyaki is to be something of a distant cousin of okonomiyaki. You take a similar batter as that used in okonomiyaki, add a few extra bits and pieces, and put a relatively large chunk of octopus in the middle. Shape it into a ball and voila, takoyaki is born! This sounds much easier than what real takoyaki is. When visiting some Asian markets in the world, I have heard that takoyaki is served with fine cut octopus pieces. This is one of the worst mistakes people can make. 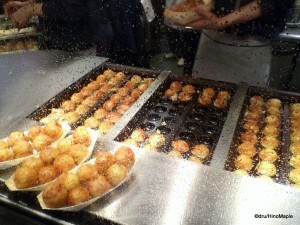 The goal of takoyaki is to have a nice crispy golden ball with a big piece of octopus inside. The crispy ball gives a nice crunch as you bite into the takoyaki, and the octopus inside provides a good contrast to the gooey dough inside. If the takoyaki is overcooked, the dough inside will be too tough, if it’s undercooked, it will be too runny. It’s almost an art to create good takoyaki. The basic way to serve takoyaki is to brush okonomiyaki sauce on top of all the balls, dust it with aonori (a type of finely ground green onion) and bonito flakes, and top with mayonnaise. You can easily add grated daikon, mustard, or even cheese to the toppings. Do beware that when you get fresh takoyaki, the balls may be cool on the outside, but inside, the doughy batter is still molten hot. It’s rare that I don’t burn my entire mouth when eating takoyaki. If you are extremely sensitive to eating hot foods, you can cut open a hole and cool it down before eating. Watching people make takoyaki is special. It’s not easy to do at all. 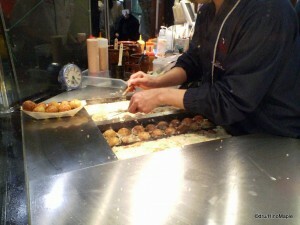 Takoyaki is made using a half sphere pan, and two metal “needles” are used to turn the balls, and eventually create the ball. It is very important that you don’t pierce the actual ball, and you have to know when to turn it. If you turn it too early, it won’t form the shape of a ball, and it won’t be as crispy either. It’s ultimately up to you, or the chef to decide the texture of the ball itself. If you go to a restaurant or shop to eat takoyaki, almost all of them will have their own display where you can watch the experts making takoyaki. It’s fun to watch and well worth the wait. 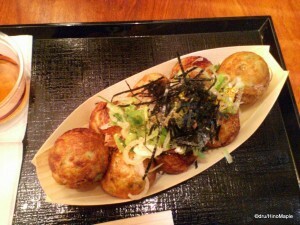 There are a few variations of takoyaki itself. Instead of octopus, you can add ham and cheese, but this is a very rare case and usually done at homes where people don’t enjoy seafood or octopus. Most of the variety comes from the crispiness of the ball itself and from the various toppings that are available. It’s best to try to basic version before trying the other versions. 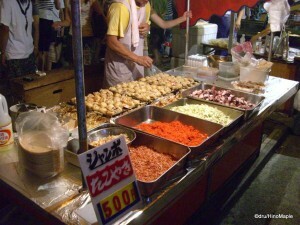 One of the best ways to eat takoyaki is to go to a festival. There are various yatai shops in these areas. A yatai shop is basically an outdoor food stall. Typically, they have nothing more than a griddle where they make various foods. The most common foods to eat are: okonomiyaki, yakisoba, takoyaki, yakitori, chocolate dipped bananas, and castella. While the food is the main attraction, watching the cooks make all of the food is a lot of fun, and hearing them scream out inviting people to buy some food is an experience that has to be seen in person. 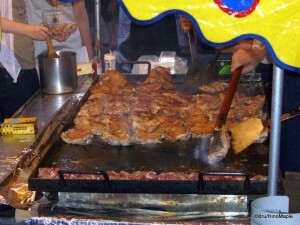 There are various other foods available at all festivals, but these foods are almost always available. When entering a festival, the food can be overwhelming. It’s difficult to know what to eat and what not to eat. I usually skip the yakitori as it’s easier to buy it at an izakaya. Desert is almost always skipped as I never have enough room left after eating everything. 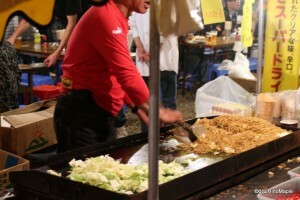 Okonomiyaki is very popular, and so is takoyaki. Yakisoba is delicious, but I prefer to skip it as I can buy it everywhere. Ultimately, it’s your choice as to what you want to eat. There are several foods at festivals that are common during certain seasons. In the winter months, you can get amazake. It’s a slightly fermented rice alcohol that tastes similar to yogurt. It’s is served warm and it’s a wonderful way to warm up, but beware of the old man who is preparing it. He might end up drinking half of the pot before you can get any for yourself. 😀 When spring time comes around, you will tend to see more doughy sweets. Castella is more popular in the spring months and it often comes in various shapes, such as Doraemon and Hello Kitty. The shapes themselves are fun to eat, but the taste can be a little bland. Summer brings out the shaved ice treats. In Japan, most yatai shops serve basic shaved ice with various flavours such as honeydew (melon). If you go to a restaurant, they will add a green tea sauce and sweet red beans on top. It’s a completely different take on shaved ice. Autumn is the start of the oden season, but oden is also served all winter and in early spring during the cherry blossom season. Oden is basically various vegetables and meats that are stewed together to create a broth. It’s delicious, but do beware of the mustard that it’s served with. It’s very spicy. It’s similar to horse radish or wasabi. If you want to try some of the more unique offerings, try out one of these as you may not see it the next time you visit. Takoyaki is a great snack when you are shopping in Japan. It’s a very common food these days and you’d probably regret not trying it if you didn’t. Yatai is less of a food than an experience. You can do both of these at the same time. I’d recommend doing both and trying both at the same time if you can. If there are no festivals when you visit, you can easily just buy takoyaki on its own and feel as if you were in a festival. This entry was posted in Food and tagged octopus, Okonomiyaki, osaka, takoyaki, Yakisoba, Yatai, お好み焼, たこ, たこ焼き, 大阪, 屋台, 焼きそば by Dru. Bookmark the permalink. Fried octopus balls sounds very awkward yet very interesting to try. I do like the different toppings and ham and cheese works for me.